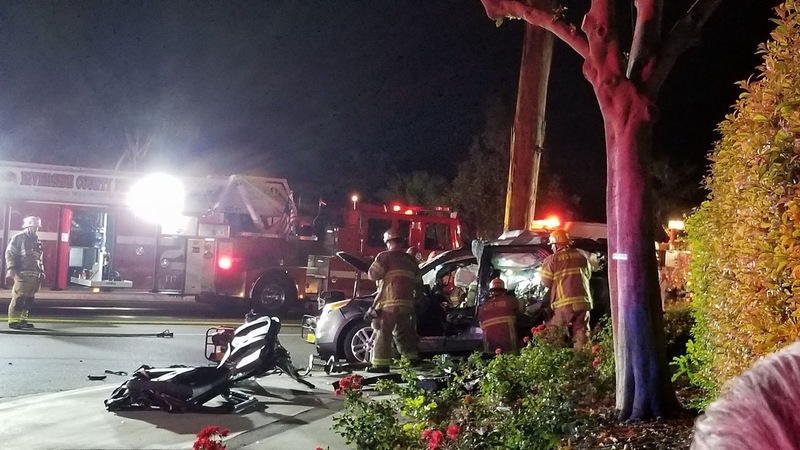 Eastvale – Riverside County Fire Department responded to a call at Halloween night about an automobile accident on the corner of Schleisman and Cedar Creek in the city of Eastvale. Captain Schmidt from the original Eastvale Fire Station 27 on Hamner said “the call came in at approximately 9:30 pm and we were out there until after midnight”. “Truck 17 from Glen Avon, Fire Engines from Station 31 and 27, all the same Fire Department, were dispatched to the scene said the Captain”. “Three people were trapped in the vehicles and had to be extricated using the “Jaws of Life” said Captain Schmidt. Capt. Schmidt said “the victims suffered minor injuries and were transported via ambulance to a local hospital to treat their injuries”. “The intersection was partially closed off to traffic while the firefighters continued working” the Captain added. An Eastvale Resident posted: “Unfortunate accident on Halloween night. Fire department is continuing to free the last passenger. Corner of Schleisman and Cedar Creek. Many accidents have happened in this corner, city of Eastvale needs to put a stop light/sign on this intersection” Another resident had this to say, “I have to tell you this city amazes me more and more every day. My husband and I heard the accident and ran out of the house quickly. There were already people running over to assist help. Calls to 911 were being made. What didn’t stop was the flood of neighbors that kept heading over to help in whatever way they could. There were dozens of neighbors that ran and jumped in to help. I even said to my husband who are all these people that keep coming. He just said “they are our neighborhood”. Thank goodness we have good and caring people surrounding us.